I found myself in separate, private discussions with a couple of high-ranking city officials recently. They were pleasantly challenging exchanges, especially because both of my conversation partners displayed intellectual curiosity and willingness to consider divergent viewpoints. Those are wonderful qualities in general, and encouraging when found in individuals who have some influence on public policy. 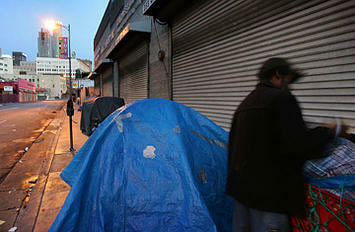 The subjects of poverty and crime in the Skid Row district of Downtown Los Angeles came up in both talks. The conversations covered various causes and effects—a changing economy, substandard educational systems, racism, the erosion of the family unit, our consumer society’s penchant for marketing violence as entertainment. It wasn’t all sociology, though—the fact that some individuals simply choose crime as a shortcut in life also came up. The talks served as reminders that any genuine improvements in Skid Row and other hard-pressed locales will require our entire society to work on a circumspect and well-reasoned plan. Los Angeles might appear to be in the first stages of such a plan with its efforts to rid Skid Row of the violent crime that has plagued the area for years. The program has had some success, but there’s still far more poverty and crime in Skid Row than would be tolerated in most neighborhoods. Indeed, it has become apparent that law enforcement can only keep a lid on things. It’s clear that the rest of us—and other public agencies—must work toward a next step or remain stalled on a recently achieved plateau that falls well short of other worthy goals. That’s where it gets tough, because I came away from the recent talks with the two high-ranking city officials filled with the feeling that too few of their colleagues have given much thought to a next step for Skid Row. I now wonder whether the most recent efforts to forge improvements have stalled because the tactic of fighting crime on Skid Row is not part of any larger strategic plan. That sort of stall might be happening before our very eyes, because most of us continue to view the poverty and crime of the area from a distance safe enough to preserve misunderstandings. Sure, the Los Angeles Police Department (LAPD) is knee-deep in crime-fighting efforts inside Skid Row. Various activists are busy keeping an eye on the LAPD. A roster of social-service providers offers stop-gap shelter and patchwork health care. Meanwhile, the dynamics surrounding Skid Row have not changed much. Some folks want the cops to clear the poverty and crime away—and some of them don’t care how the job gets done. Another contingent views the whole thing from a few blocks away, anxious to somehow hear a magical “all-clear.” Some sit farther away, concerned only with keeping whatever is going on in Skid Row from bumping against their neighborhoods. It struck me—after I had a chance to reflect on the recent conversations with the two city officials—that any progress on poverty and crime in Skid Row will require one key ingredient that hasn’t gotten much attention lately: Jobs. When is the last time you heard anyone talk about work when the topic turned to Skid Row? I realize that some folks there won’t be able to work. There has been too much chemical and emotional damage, and they will be wards of the larger society for the rest of their lives. There are, however, many in Skid Row who would welcome a chance to earn a living, willing to do what it takes to make that possible. That means rehabilitation and training—and incentives for employers willing to serve as a bridgehead for workers who will likely be special cases for a period of time on the job. Someone will have to figure out what sort of employers might consider such an idea. We’ll have to determine what it will take to draw jobs to locations in or near Skid Row, or entice employers already in the area to do more local hiring. That’s a next step into another multi-tiered challenge. It’s a challenge that must start with jobs—or at least a requirement that the concept of work returns to the conversation when we talk about “cleaning up” neighborhoods such as Skid Row. Jerry Sullivan is the Editor & Publisher of the Los Angeles Garment & Citizen. Submitted by ducafeli on Tue, 10/21/2008 - 14:54. One day I found myself looking for obscure "glam rock" compilations on Amazon UK and the "customers who bought this" recommendation led me to an album called "Breathlessly Brett" an LP originally recorded in the mid-1970s -- but not released until 2003 -- by a then teenage performer named Brett Smiley. It seldom left my CD player for the next month. I'd never heard of Brett Smiley before, but when I did a search on him, an interesting story emerged. Smiley was just 16 years old when he was discovered by Rolling Stones manager Andew Loog Oldham. At 18, he was given a $200,000 recording deal and recorded an album, produced by Oldham and with Steve Marriott from the Small Faces on guitar. An amazingly raucous single "Va Va Va Voom" was released and heavily hyped with Smiley's face appearing in ads all over London and in an extremely over the top performance and interview on the popular Russell Harty Plus TV program. The single bombed, the album was shelved and other than a few brief film cameos (like "American Gigolo") Smiley wasn't heard from again until 2003 when RPM records acquired the master tapes. The sad truth was the Smiley wallowed in serious, skid row drug addiction for years. His legend proved strongly intriguing for glam rock fans and Johnny Thunders biographer, Nina Antonina, wrote a book, The Prettiest Star: What Ever Happened to Brett Smiley about how Smiley's brief pop supernova moment influenced her teenaged years. Now recovered from the drug excesses of his past, Smiley continues to record and perform, mostly around New York City. You are absolutely right about jobs. Submitted by 2533217 on Sun, 08/31/2008 - 08:28. To climb people need hope. The most sustainable source of hope is a job. I enjoy reflecting on the thoughtful observations you've made in this and other pieces about urban renewal, gentrification, de-segregation, and distribution of affordable housing. But this piece really hits home. Nice going. Submitted by davebarnes on Thu, 08/14/2008 - 09:45. Just relocate all the people in LA's Skid Row to San Francisco. The homeless benefits are better and the lefties in SF appear to want to have more bums on the street. You could solve LA's problem in a week.